Responding to RFPs isn’t always a high priority for others at your organization. The email is ignored, the deadline is missed—other shinier work wins their attention over an RFP most of the time. But, for you? RFP response is your entire world when you’re a proposal manager. You are the glue holding everything together for a critically important process. Winning an RFP means winning new business. It’s that simple. What isn’t simple is how you get to that win. Rest easy, hard-working proposal manager. A hyper-efficient RFP process is now absolutely possible with the right technology. Best-in-class organizations know this already and they are choosing proposal management tools like RFP software to support their efforts. There are survival guides out there that help you wrangle the RFP process. This is different…this is your success guide. By taking time out of your hectic day to read this guide, you’ve already made the choice to become the kind of proposal manager that leads your organization to greater heights with RFP response. Let’s discuss how to make it all happen with the most advanced proposal management tools you can get your hands on. Once upon time there were no proposal management tools. For the sake of this dramatization, we’ll call it the Dark Ages for RFP responders. The plague was an inefficient manual process, one involving complex spreadsheets and documents that infected the health of entire organizations. Responding to RFPs took too long to complete and deadlines were inevitably missed. SMEs (subject matter experts) and proposal managers found it difficult to collaborate. They rushed the deliverable and submitted outdated, boilerplate responses instead of customizing the strongest possible content for each prospect. Eventually this plague of RFP inefficiency caused famine to strike organizations. They responded to fewer RFPs, and they did not win the RFPs they did submit. No matter how hard the proposal managers tried, they couldn’t manage on their own. One day, they hoped, something like RFP software would be dreamed up and the Dark Ages would be gone forever. Thankfully, we’re not in the Dark Ages anymore. There is a wealth of technology available to support the RFP response process. 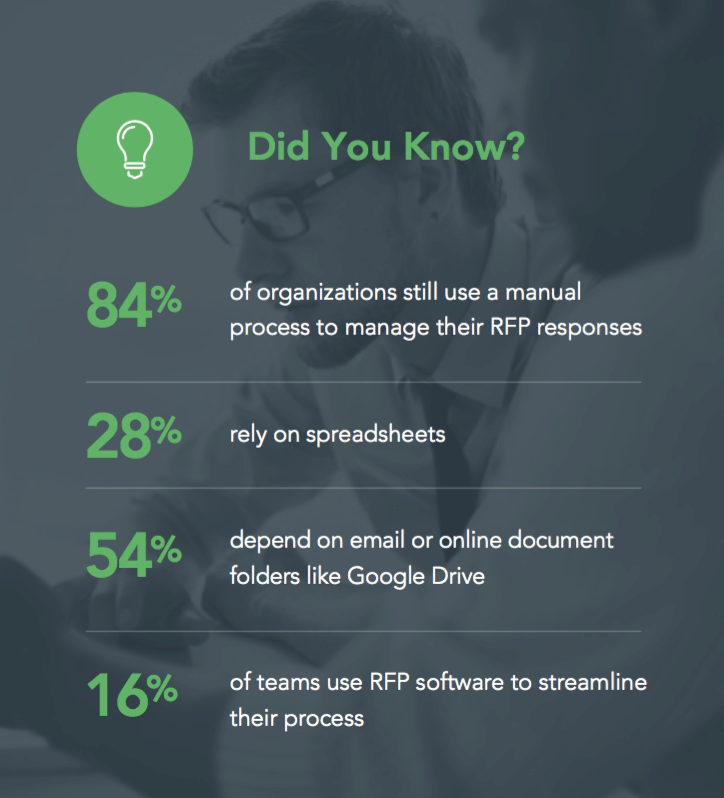 However, a surprising 84% of proposal managers are still using a manual approach with RFPs today. The question is: Why? Do more with less and become experts at efficiency. “Doing more” might mean the ability to submit more RFPs, which translates to additional opportunities for generating revenue. 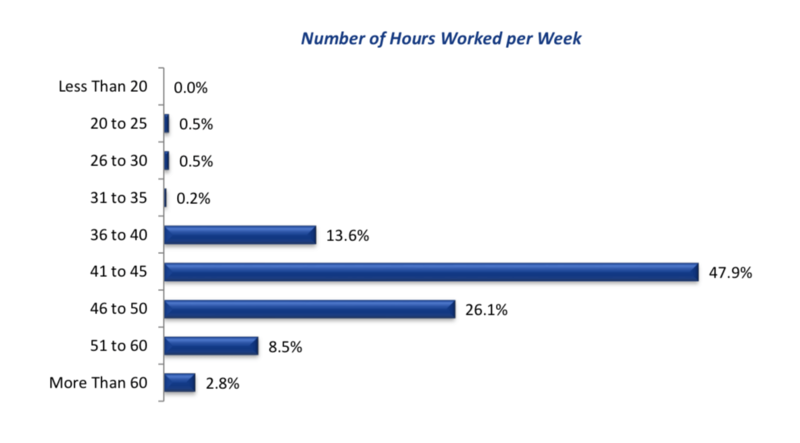 The “with less” part of this equation might mean fewer hours required from SMEs to pursue these opportunities. Establish a collaborative ecosystem that works. Collaboration is a necessary step in every RFP project. Having an easier way to communicate makes the entire process run smoother, whether you need to ask sales to contribute to a section or ping marketing for the final buff and polish. Achieve more quality control, and more wins as a result. Quality responses separate winning organizations from the rest of the herd during vendor selection. More time to focus on creating the best content will help you stand out as the partner that cares, versus another who cuts corners. The initial investment into a proposal management system is ultimately worth it when the organization saves time and resources. With a good solution, typically these benefits are visible as early as the first RFP project. Response teams see an immediate increase in productivity, so they can do more of their best work. You’ve probably heard some negative things about RFPs from your peers and colleagues. It’s common for professionals to dislike RFP projects because of the inefficiencies they have faced firsthand over the years. But, the importance of responding to RFPs can’t be stressed enough—they are a must for any growing organization. If you want sales, you have to do the work. And, teams have to work together. 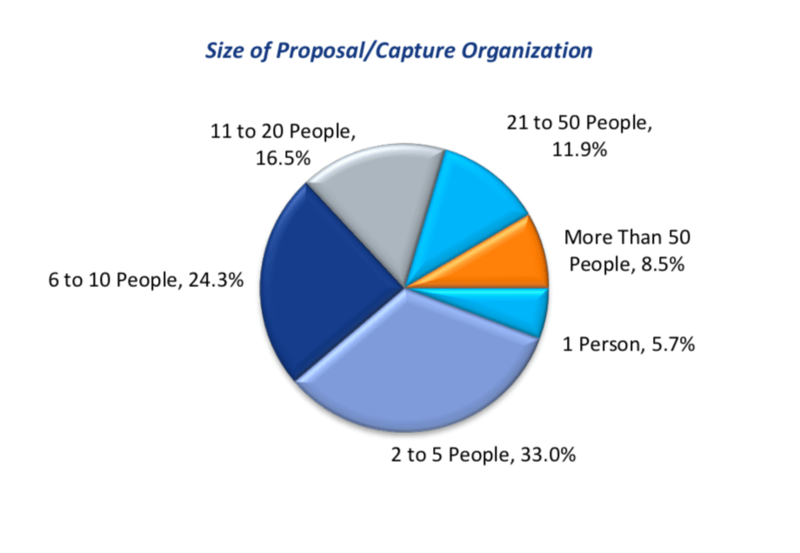 A Proposal Manager is responsible for proposal development (e.g., written, oral, demonstrations), including maintaining schedules, organizing resources, coordinating inputs and reviews, ensuring bid strategy implementation, ensuring compliance, resolving internal team issues, and providing process leadership. Importing and Exporting – Importing from any file source (yes, even PDFs and spreadsheets) and exporting back into the original source or customized template allows you to focus on a quality deliverable. Knowledge Sharing – Bringing greater accessibility to company information not only promotes collaboration on RFP projects, it also breaks down document silos across departments and even the organization. Project Management – Being able to track real-time progress of RFx completion helps you see when sections are being taken care of. Communication with SMEs is quicker without email, since you can use @-mentioning and Slack. It’s not easy to be in your shoes, dear proposal manager. You handle the complexities of RFP responses and it’s up to you to keep your team motivated. If you bring in a proposal management tool to support your RFP response process, then your job becomes a lot easier. The bane of pretty much any proposal manager’s existence is the import and export process with RFP responses. When an RFP lands in your inbox, it should be cause for rejoice. 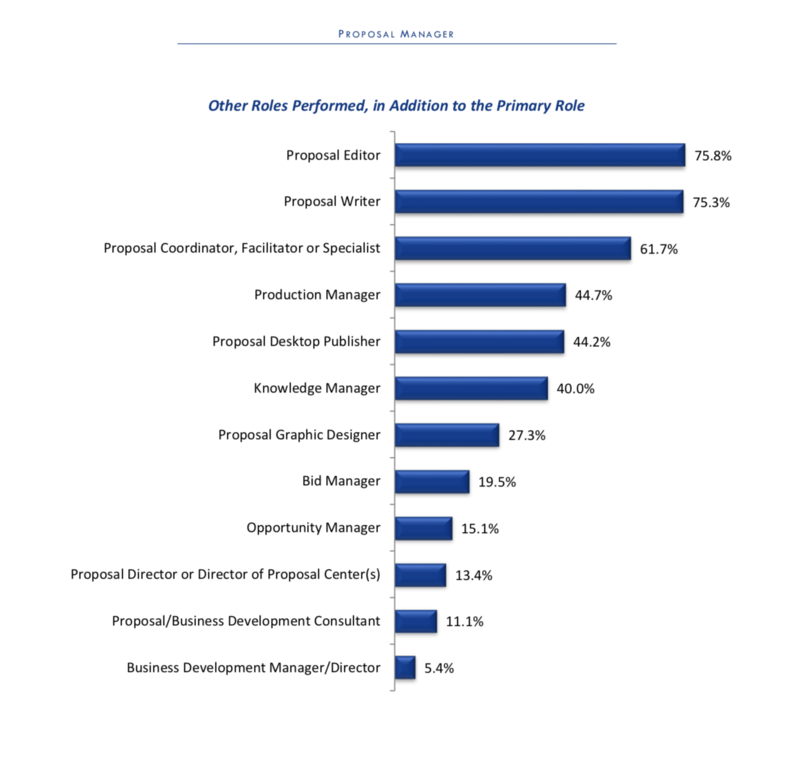 Responding to an RFP is a chance to win new business, after all. Yet, when starting an RFP project, you’re working with a source document that could be anything from a long-winded Excel to a pesky PDF. Copying and pasting, organizing and filtering suddenly fill your days as you try to ready the documents for your SMEs. It’s end of the RFP project, now you’re ready to rejoice. Or, so you thought…now it’s time to export everyone’s responses back into the prospect’s source file. Exporting is the stage where hours slip by as formatting blunders take over the Wednesday evening you were hoping to spend at home cooking dinner with the family. Instead, even though you thought you had this project under control, you’re at the office trying to submit an RFP right before the deadline. Every import and export is actually a time-savings opportunity. RFP software allows you to start your RFP project off on the right foot by importing effectively from any source—docs, spreadsheets, even PDFs (RFPIO is the only solution that imports PDFs). Instead of copying and pasting like crazy, you can simply pull the source document right into the platform and start organizing and assigning sections to SMEs. Exporting back into the original source or a template of your choosing ensures consistency with your deliverable, without the manual labor. We’ve heard plenty of disheartening stories from proposal managers who stay after-hours or work weekends to submit an RFP before the deadline. With the exporting capabilities you enjoy with RFP software, you will dramatically speed up this process so you can have more work-life balance. Information silos are truly a point of weakness for any organization. When teams don’t have equal accessibility to important company content, it causes inefficiencies well beyond the RFP response process. On the flipside, organizations with centralized information promote collaboration and growth. With RFPs, the expertise SMEs provide is indispensable. They harbor technical specs and product information that you certainly don’t know, because those details are outside your domain—not to mention, this information is practically a foreign language. As long as SMEs contribute to RFP responses regularly, you’re fine, right? As long as they don’t leave and take that knowledge with them. Workflow is fragile business with RFPs, so you want to do everything in your power to store company information in a place where anyone can find it quickly. The way we share information impacts the way we work. RFP software promotes a culture of knowledge sharing, and ultimately strengthens communication companywide. An RFP content library eliminates document silos entirely, because it offers one place for company content to live. Instead of being in Google docs or email folders, RFP responses are organized with tags and star ratings to help you and your team find the best content in seconds. The great thing about having all company information handy like this is how easily you can improve the quality of your content. Performing regular content audits ensures that you keep your most valuable RFP responses up-to-date and ready to grab on the go. Effective project management is truly the heart and soul of the RFP response process. Every RFP project requires multiple team members to share their expertise, as a proposal manager only knows so much about the organization. This is where the SMEs come in to offer their support. But trying to track them down often proves difficult for proposal managers. SMEs are busy and they have other high-priority projects on their plates. With a manual RFP process, collaboration with team members is more challenging because much of the communication happens through email and meetings, which get missed or forgotten. You don’t want to just get the job done, you want to get it done well. Having full visibility into the RFP project means you know which SME is handling specific sections, so you can keep tasks and owners straight. With the project overview dashboard, you’ll see where SMEs are in terms of progress so you can avoid beating down their office door when the deadline is looming. Integrations with Slack and Salesforce make communication more seamless for busy teams, with less of a chance for an important email to be missed. Fewer emails and meetings keep SMEs focused on what they need to accomplish so they can share their input and move on to other priorities. The proposal management industry continues to evolve with advances in technology. No longer do proposal managers need to feel alone, and no longer do SMEs need to dislike contributing to RFP projects. 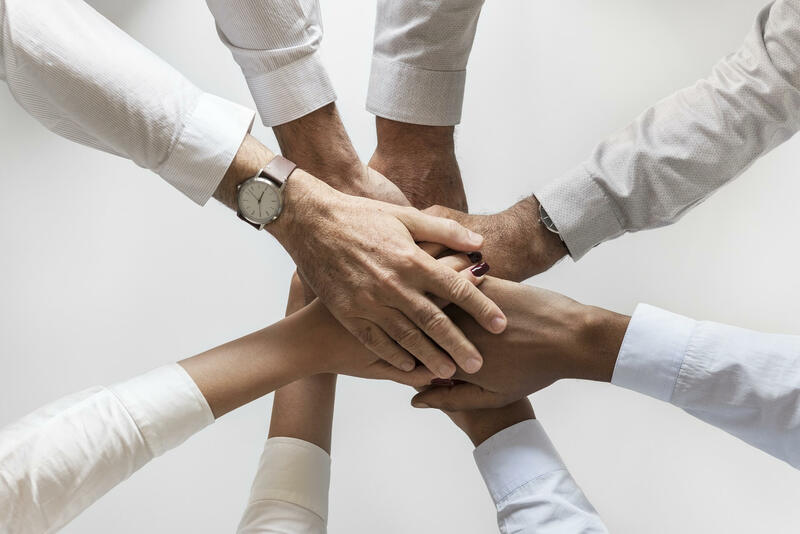 Knowledge sharing and collaboration are becoming more common among organizations who recognize the need to band together to be more successful with RFP response. This improvement in teamwork positively affects multiple aspects of the business, far beyond the next RFP project. RFP response is your business—more so than anyone else’s at your organization. Be the leader that takes charge with your RFP response process and guide your team toward greater success. It’s time to take this success guide a step further. Schedule a demo to learn how RFPIO will make your RFP response process a mighty one.